Garments QC/QA Check Points: There are four sections of garments quality controlling process, these can generate defects in manufacturing, sections are cutting, sewing, washing and finishing, and must be there some criteria check QC team for garments product quality. 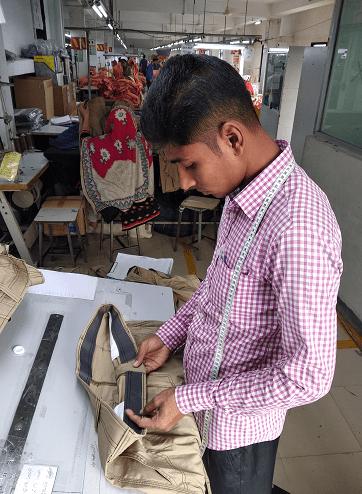 This article clearly showing quality controlling criteria of every quality checkpoints of a garments factory and simply described garments quality requirement. Hopefully, after reading this you will have a good idea of Garments Quality Check Points and Their Quality Control. Here given section wise quality checkpoint description for your better understanding as mentioned every work of garments quality control department. Fabric upside down: Make sure the fabric is not upside down. Fabric Skewing: A maximum skewing of 2 cm for the chest of 60 cm is acceptable, but not more. This defect can be solved by re-setting of the fabric at the fabric mill. Relaxation: Before cutting, knitted, elasticized woven fabrics should be suitably relaxed for around 12~24 hours or more, depending on the type of fabric. Relaxation is mandatory for stretch fabrics. The height of cutting pile: The higher the pile on the cutting table, the more chance the cut pieces are unequal in size. This can lead to size specification & fitting problems. Make sure the height is suitable for the type of fabric (usually 2~3 inches and never more than 5 inches). Numbering and bundling: Make sure the different parts are properly numbered to avoid shading and that this numbering can be easily removed after sewing is complete. Storing: Make sure the different parts are properly stored, for example, rolled, and not folded. Critical operations: Check all critical operations repeatedly (like the sewing of the neck- seam, armhole, cuff, placket etc. ), so the operator gets the clear input of what is required and how to make it correctly before large quantities of garments are finished. Checking bonding strength of interlining in the fusing process. Seam allowance: check operators repeatedly on this point to make sure they use the correct seam allowance. Numbering: Make sure the sewing operatives keep parts with the same number together to avoid shading. Confirm Garments styling construction and measurement is correct as per approved sample. Washing method: normal wash, stone wash, sand wash or enzyme wash.
Record the identification of the sealed sample, quality standards on the final inspection report to ensure QC check the bulk according to the correct standards. Tick and sign all quality standards as an indication of proper QC checking. QC should not release the shipment if they find the following major faults. Should avoid the press and fold the pigment dyed fabrics before garment washing entirely. It is because it will leave a clearly visible mark on the garment after washing. After sewing, put the garments on a hanger until washing starts. After completing carton, Garments buyer QC does a Final quality inspection, evaluate final product quality. Final Audit or inspection is the most important factor for a garments factory. Final Audit is the final judgment of product quality from the buyer, the inspection calibrates overall garments factory quality controlling. Without passing final inspection, garments cannot be shipped. A final inspection report is the quality certificate from garments buyer what give a certificate of a factory about their finished product quality that allows or reject to ship garments. There are specific quality checking points of a finished garments final audit, here I have given these in below. Tagged Button Attaching and Button, Check Pressing, Cutting Process Quality Check Point, Final Inspection Quality Check Points, Finishing Process Quality Check Point, Full Garments Quality Check, Garments Quality Check, Garments Quality Check Points, Garments Quality Check Points and Quality Control, Garments Quality Check Points and their Checking Criteria, Garments Quality Check Points and Their Quality Control, Packing and Carton Quality Check, Quality Check Points of Garments, Quality Inspection Criteria’s are of Final Audit, Section wise Garments Quality Check Points, Sewing Process Quality Check Point, Washing Process Quality Check Point.